When trading with live animals, our attention is particularly the organisation and the execution of transport. Depending on the destination, distance, climate and the number of cattle as well as the wishes of customers, we choose the optimum variant for a careful transport of the breeding animals to their target destination. The transport by means of special trucks is used most often. For longer distances, the use of vessels or airplanes is also part of our day-to-day business thanks to our many years of experience! 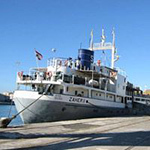 Veterinary management, preparation of the transport documents and accurate customs documentation are taken for granted. 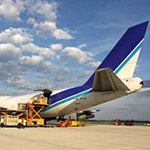 We develop the ideal transport concept together with the customer. 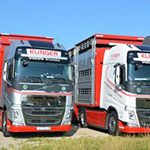 The trucks are equipped with special constructions and are thus predestined for the careful transport of pregnant breeding heifers and high quality breeding cattle far beyond the borders of Europe. Our experienced employees guarantee a frictionless journey in compliance with all legal requirements in accordance with VO EC 1/2005 (feeding, rest periods, etc.). Own supply stations with quarantine status directly to the main transport routes allow a hygienically safe stay. The breeding animals are fed under veterinary supervision, watered and have the freedom to move in straw-covered indoor facilities or to rest as needed. We follow a strict company policy that provides to strictly comply with the requirements of space for the animals as well as to strictly follow the existing animal welfare regulations of the EU. Your animals are close to our heart - we ensure they reach their destination healthy!